On October 30th, 2008, USA Today ran this article. It basically outlines how school districts and counties across the United States are imposing rules and regulations on employees regarding tattoos. Bountiful, Utah passed a law this past August banning new city employees for rocking any visible tattoos. 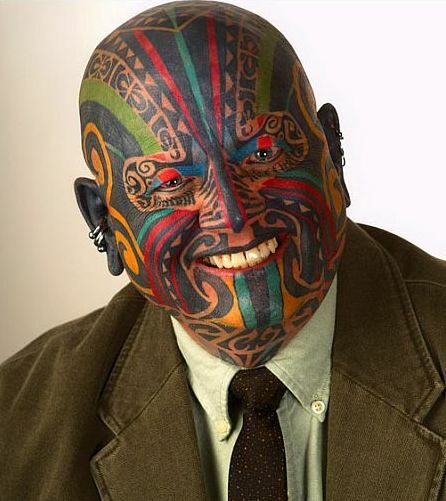 Tattoos that are seen on the head, face, neck and hands are now officially banned and anyone seeking work for the city who is sporting art in these areas will not be hired. The Joplin School Board in Missouri voted mid-October on whether or not visible tattoos were appropriate for its teachers. The vote determined that no, tattoos were not appropriate and next year there will be no room in the school board for teachers with them. The Pasco County School Board, Florida, decreed that its teachers be free of visible tattoos that are “offensive to community standards.” School principals are given free reign in determining what exactly “offensive to community standards” means when assessing their school’s teachers. This is how I see it: The school boards have decided to reaffirm a supposed negative stigma by refusing to support its qualified professionals because of choices these individuals made in exercising their personal rights and free will in regards to their own bodies. Instead of recognizing that tattooing has become a generally accepted form of artistic self-expression – instead of recognizing that tattoos are no longer things borne by sailors, convicts, gang members etc., etc., etc., and that regular Joes, soccer moms, and even grandparents are getting tattoos nowadays – these school boards and cities have decided to perpetuate their ridiculous outdated stigmas when they should be creating environments that are modern, tolerant, open-minded, progressive and free from discrimination. I whole-heartedly, fully agree. We need to move forward, not backward. These ridiculous policies are severely outdated and, in my opinion, embarrassing. I think it’s sad that the close-minded mentality of a few devolved individuals means that truly good, decent, qualified, hardworking people will be legally barred from certain types of employment. Personally, I want my kids to have teachers like the University of New Mexico public speaking teacher Bruce Potts (that’s him in the photo above), with tattoos and piercings. I want my kids exposed to all kinds of people so they grow up to be worldly and accepting of people of all sizes, colors and creeds. I want my kids to know that different doesn’t mean bad and that white-bread conservatism doesn’t mean good.